By relying on the services of a mortgage broker, you leverage their expertise and network to get the best mortgage deals at negligible or no cost to you. Unfortunately, the services provided by mortgage brokers are fraught with misconceptions. Falling prey to these false facts, customers may avoid seeking the services of a mortgage broker, ending up with a mortgage product which is not in their best interest. 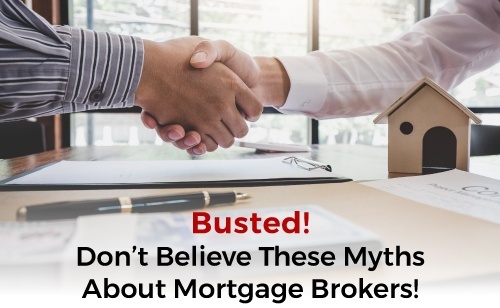 To help you steer clear of these misconceptions and make you aware of how the services offered by a mortgage broker can help you, I have debunked three of the most widely believed myths about mortgage brokers. Myth 1: You don’t need a mortgage broker. Many people approach their personal bank when applying for a mortgage, assuming they’re getting the best mortgage rate and terms. While banks only have their own products to offer, a mortgage broker has access to a network of lenders and can help you to find the best mortgage to suit your individual needs. Myth 2: A mortgage broker charges you a huge fee. A mortgage broker acts as your advocate and is paid a referral fee by the lender with whom they interface. They do not charge fees from clients and leverage their contacts, market knowledge and understanding of the client’s profile to procure the best mortgage deal to suit their needs. Myth 3: If you have a poor credit history, you won’t qualify for a mortgage. A mortgage broker is not discouraged if their client’s credit history is not good. Their focus is to get the best possible mortgage deal for a client irrespective of the credit history. The network of a mortgage broker, not only consists of major banks and financial institutions but also ‘Class B’ and ‘Class C’ lenders. ‘Class B’ and ‘Class C’ lenders consider mortgage applications from clients even if their credit history is not good and therefore a mortgage broker can use their vast network to help you to qualify and obtain a mortgage in spite of challenges. If you’re looking to gain the benefit of experience, knowledge, and skills of a respected, professional mortgage broker to help you with your mortgage needs, reach out to Angela Milosevic. As an accredited mortgage broker in Cambridge, Ontario, with over twelve years of experience, I have a reputation for providing the best mortgage services to clients. I have successfully assisted clients to meet their needs across a range of mortgage products. Outstanding customer service and a strong lender relationship have been instrumental in being able to find the right product or service for a client irrespective of the challenges. In addition to superior mortgage services, I ensure that clients receive regular updates regarding market conditions and other relevant information to help make important homeowner decisions. For a complete list of the services with which I can help you, please click here. If you have any questions or need guidance on how your needs related to mortgage services can be met with the highest standards of service delivery, please contact me by clicking here.